Getting Things Done is arguably the world’s most well known book on productivity. The lessons in this book should be considered essential reading for anyone looking to pursue a more productive lifestyle. Normally when I write a book summary I outline the main points from each chapter. However with GTD, the book is jam packed with information and ideas. In order to make this summary useful, actionable and concise I thought I would summarise the main lesson from the book as a whole instead of each individual chapter. 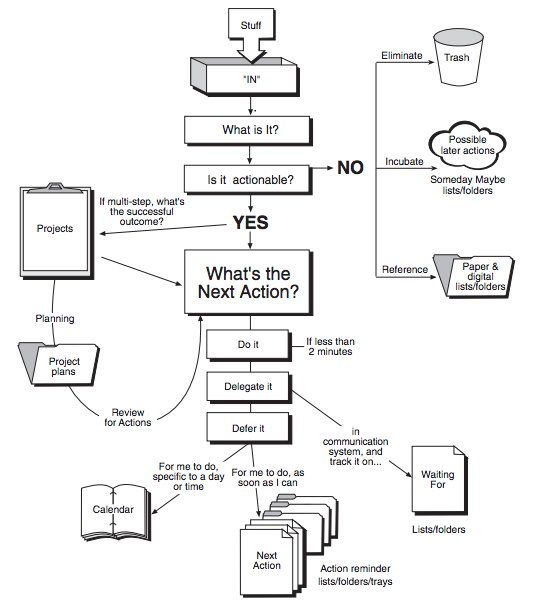 DOWNLOAD THE GETTING THINGS DONE SUMMARY PDF FOR FREE! Collecting all your work together and getting everything out of your head is the first stage of mastering your workflow. By gathering everything together like this, you don’t need to actively try and remember to do things. Instead you’re collecting it so it can be put into a system that will do the reminding for you. The in-basket represents a place where you can collect all of your work and open loops. For example, this could be your email inbox, a physical inbox or apps like Evernote and to-do lists. When collecting your work, it’s important to get everything out of your head and into one of these baskets, even if this means jotting down a note on a piece of paper and physically putting it somewhere. Or, as I prefer, writing a note in Evernote or creating a to-do item in Asana. It’s also important to not go overboard with the number of in-baskets you manage. The goal with any in-basket is to empty it regularly and the more in-baskets you have, the harder it becomes to process those items later. Emptying your in-basket regularly is an essential part of getting things done as it helps you avoid getting overwhelmed by work. Processing your work is all about taking everything in your in-baskets and working out what needs to be done with those items. A lot of people make the mistake of thinking they have to do things straight away when they arrive in their in-basket. Or if they don’t do them straight away, they promise to come back to them later, but fail to organise those things correctly which is when tasks can slip through the cracks. Processing your work and mastering this stage of GTD allows you to prioritise tasks and empty your in-basket (including your inbox) without necessarily having to do any work. This is a simple, yet important step. Answer the question, “what is the thing your’e dealing with?” Perhaps it’s an email from HR but what is it actually about? Is it an unimportant update about employee contracts, or is it some boring reminder about health and safety? Identifying the stuff in your in-basket allows you to effectively answer the next question. Yes – If an item is actionable, you must first identify the “project” it’s part of (see “Projects“) and the “next action” required to move that item towards completion (See “Next Action”). No – Often, the stuff in your in-basket requires no further action required. In which case, you can do one of the following three things (see “Trash”, “Someday/Maybe” and “Reference”). The “next action” is exactly what it sounds like. It’s the next thing you need to do to take that item towards completion. For example, you might have a completion goal to write a blog post, but the very next action might be to simply draft a topic. If the answer to this question is “yes”, just do it then and there. Easy. If the answer is “no”, you can ask yourself, “am I the right person to do this?” or “can someone else do this?”. Depending on these answers, you can delegate the task. Finally, if you do need to do the work and it’s going to take longer than 2 minutes, you can defer it to later. Once you’ve processed your work using the above system, it’s time to get organised and get the stuff where it needs to be to be of use. These are the things you might want to come back to one date and that aren’t attached to any particular time frame. It could be an idea for something you’d like to do in your business, a skill you’d like to learn or a recipe to try. File these on a “Someday” list which you will review on a regular basis. TIP: I use a “Someday” tag in Evernote to collect ideas of things I’d like to come back to one day. These are the useful things that don’t require any action, but might come in handy later. It could be a supporting document for some piece of work, a spreadsheet of information or useful checklist. When you add something to your reference list, give it some context and keep everything organised. TIP: Again, I keep useful articles and resources organised in Evernote and Google Drive. Finally, if there is no point in keeping an item for reference and you don’t want to come back to it later then get rid of it. You don’t need any more clutter in your life. A project is literally anything with more than two action steps that need to be completed e.g. planning a trip, buying a new TV or running a marketing meeting. When you identify an actionable item, you should record this on your master projects list which then gets reviewed on a regular basis. Keep a track of things you’re waiting for by creating a “Waiting” list. This could be as simple as a tag in your email for messages you are waiting for a reply for. You can also set a reminder on your calendar to follow up with someone at a later date. Deferred work that is time sensitive goes on your calendar to be completed at a specific time. GTD stresses the importance of ensuring that your calendar is only used for these time sensitive items and nothing else. This could be things like: call John on Friday (day specific) and attending meetings (time specific). We’re nearly there…. once you’ve organised everything so it’s in the right place, it’s important that you review your “next actions”, “calendar” and “waiting” lists on a regular basis. It’s likely that you’ll refer to your calendar first as this will play a big part in your day. Then during your discretionary time you can review your “next actions” for anything that you can do before your next appointment. Finally you can check up on your “waiting”, “projects” and “someday” lists for anything that you might want to address. You only need to review these last few lists as often as you need to so that you ensure they don’t get too long and unmanageable. As well as these daily reviews of your lists, it’s important to schedule a “weekly review” in your calendar. During this time you can address all your lists to ensure you’re happy with how everything is organised. Often things can get a bit messy over the course of a few days and the weekly review is a chance to tidy up those lists. Perhaps there’s something on your “someday” list that you’d like to address, so you add it to your “next actions” for the following week. It’s now time to do some work. At last! Based on your review you will be able to decide what to do. You might have an appointment, or you could address some items on your “next actions” list. When deciding what on this list to tackle first, you can consider the amount of time/energy you have, the context you’re in and it’s priority. For example, if you have only 10 minutes before you’re next meeting, you can make a phone call on your “next actions” (time). Perhaps there’s an item on your list that can only be done when you’re at the computer or on the phone (context). Or maybe there’s something on your list which is going to be more beneficial than others if completed (priority). And there you have it. This is a basic overview of the “getting things done” workflow for collecting, processing, organising, reviewing and doing work. It’s a very flexible system which can be adapted and customised to how you like to work. I use a number of apps to stay organised and have spent a number of years refining how I use this system.